Iraqis have a saying: “The rug is never sold”—meaning that there’s always more money to be made from any transaction. American defense contractors would agree. The current American war in Iraq is a struggle in search of a goal. It began in August as a humanitarian intervention, morphed into a campaign to protect Americans in-country, became a plan to defend the Kurds, followed by a full-on crusade to defeat the new Islamic State (IS, a k a ISIS, a k a ISIL), and then… well, something in Syria to be determined at a later date. In the meantime, Washington’s rallying cry now seems to be: “Wait for the spring offensive!” In translation that means: wait for the Iraqi army to get enough newly American-trained and -armed troops into action to make a move on Mosul. That city is, of course, the country’s second largest and still ruled by the new “caliphate” proclaimed by Islamic State head Abu Bakr al-Baghdadi. All in all, not exactly inspiring stuff. You can’t have victory if you have no idea where the finish line is. But there is one bright side to the situation. If you can’t create Victory in Iraq for future VI Day parades, you can at least make a profit from the disintegrating situation there. In the midst of the December holiday news-dumping zone, the US Defense Security Cooperation Agency (DSCA) quietly notified Congress of several pending arms deals for Iraq. DSCA is the Pentagon office responsible for coordinating arms agreements between American defense contractors and foreign buyers. Before those thousands of not-boots-on-the-ground troops started hemorrhaging back into Iraq late last year, DSCA personnel made up a significant portion of all US military personnel still there. Its staff members are, in fact, common in US embassies in general. This shouldn’t be surprising, since the sales of weaponry and other kinds of war equipment are big business for a range of American companies, and the US government is more than happy to assist. In fact, there is even a handbook to guide foreign governments through the buying process. The DSCA operates under a mission statement which says the “US may sell defense articles and services to foreign countries and international organizations when the President formally finds that to do so will strengthen the security of the US and promote world peace.” While the Pentagon carries out the heavy lifting, actual recommendations on which countries can buy US gear are made by the secretary of state, and then rubber-stamped by Congress. As for countries that can’t afford US weaponry, Washington has the Foreign Military Finance program up its sleeve. This opens the way for the US government to pay for weapons for other countries—only to “promote world peace,” of course—using your tax dollars, which are then recycled into the hands of military-industrial-complex corporations. And what will all that firepower cost? Just under $3 billion. Keep in mind that these are only the most recent proposed sales when it comes to tanks. In July, for example, General Dynamics received a $65.3 million contract to support the existing Iraq M1A1 Abrams program. In October, the United States approved the sale of $600 million in M1 tank ammunition to that country. There have also been sales of all sorts of other weaponry, from $579 million worth of Humvees and $600 million in howitzers and trucks to $700 million worth of Hellfire missiles. There are many more examples. Business is good. While the collapse of the Iraqi army and the abandonment of piles of its American weaponry, including at least 40 M1s, to IS militants, helped create this new business opportunity for weapons-makers like General Dynamics, the plan to cash in on Iraq can be traced back to America’s occupation of that country. Forward Operating Base Hammer, where both Private Chelsea Manning (she collecting State Department cables for WikiLeaks) and I (supervising State Department reconstruction efforts) lived for a year or so, was built across the street from the Besmaya Firing Range. That testing grounds was US-outfitted not just for the live firing of artillery, but for—you guessed it—M1 tanks. It was to be part of the pipeline that would keep an expensive weapons system heading into Iraq forever. In 2011, as US troops left the country, both facilities were “gifted” to the Iraqis to serve as logistics bases for training in, and the repair of, US-sold weapons. As I write this, American contractors still live on the remnants of Hammer, supporting the Iraqi army’s use of whatever M1 tanks they didn’t turn over to the Islamic State. On a contractor job-review site, “job work/life balance” at the base gets an acceptable 3.5 stars from those working there and one American trainer even praises the fact that work starts and ends before the heat of the day (even if another complains that the only toilets available are still port-a-potties). Would You Like the Extended Warranty? Iraqis have a saying: “The rug is never sold.” It means that there’s always more money to be made from any transaction. General Dynamics would agree. Arms sales work remarkably like consumer electronics (and Iraqi carpets). Want the extended warranty for your new smartphone? Extra battery? Accessories? Insurance against loss or damage? Suddenly the cost of your phone doubles. Same for tanks. The M1 is a complex beast. You’ll need to pay General Dynamics for trainers to teach your guys to operate its systems. You’ll need lots of spare parts, especially operating in the desert. And it won’t be long before you’ll want to do some upgrades—maybe better computers or a faster engine. 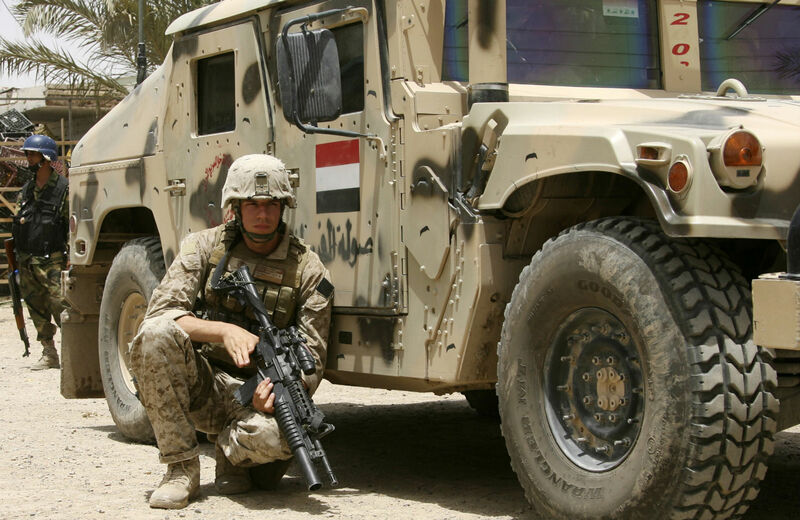 The United States is currently working on “urban warfare” upgrades for the 140 M1s the Iraqis have hung onto. In the defense world, these after-sales are known as the “tail.” And the longer the tail, the bigger the profits. For example, built into the contract for the new M1 tank sale is the provision that “approximately five US Government and one hundred contractor representatives [will] travel to Iraq for a period of up to five years for delivery, system checkout, program support, and training.” And that isn’t going to come cheap from General Dynamics, though the five government employees may be a bargain financed by American taxpayers. None of this even touches on the potential for repeat sales. After all, most of the Islamic State’s heavy gear comes from stuff the Iraqi army abandoned or somehow lost in their headlong flight from the country’s northern cities. And keep in mind that every tank and shell IS pulls out of that inventory means more business for General Dynamics and similar firms. Essentially selling weapons to both sides of a conflict is smart business. Big, heavy military equipment, however, takes months to manufacture. So even a quick order placed today doesn’t mean your gear will arrive in time for that promised spring offensive. So why not buy, or have gifted to you, something pre-owned and ready for immediate delivery? If you’re the government of Iraq, the US military is already way ahead of you on this. Since June, the United States has been stockpiling massive amounts of gear coming out of Afghanistan at Shuaiba, a port in Kuwait, in preparation for ultimately shipping at least some of it across the border into Iraq. The depot already houses 3,100 vehicles, mostly the Mine-Resistant Ambush-Protected (MRAP) vehicles ubiquitous in America’s wars. MRAPs are useful for protecting troops from roadside bombs, including the Explosively Formed Penetrator (EFP) versions made in Iran that took the lives of many Americans during Iraq War 2.0. That must take a weight off Iraqi minds. Another thing that may help: the United States has already donated 250 MRAPs to Iraq as well as $300 million in weapons handed over free-of-charge by the Department of Defense in 2014. And don’t forget: into an omnibus spending bill Congress passed last month is tucked $1.2 billion in future training and equipment for Iraq. And let’s not forget either all those need-to-be-replaced bombs being regularly dropped on Iraq by the US Air Force at a cost of up to $1 billion and counting. Are Tanks Good for Anything Other Than Profits? For Congress to approve the DSCA arms deals, the Department of Defense must certify that “the proposed sale of this equipment and support will not alter the basic military balance in the region.” So the tanks to fight IS will have to be certified in writing not to affect the regional situation. Whatever the Iraqis think they need the tanks for, America’s nine-year-long slog through Iraq War 2.0 should have offered a lesson in how relatively useless heavy armor is for the kind of urban fighting and counter-insurgency warfare usually seen against a foe like IS. In fact, the logistics needed to maintain an M1 in combat can actually slow an advance, while the steel beasts are relatively easy targets in the confines of a Middle Eastern city like Mosul. Maybe, in the end, some of those M1s will even land in Iranian hands, given the robust role that country is playing in the current Iraq war. America’s front-line military technology could, in other words, find its way into the hands of people capable of a little reverse engineering to mine technology for Iran’s own tank corps or to sell on the world market. It seems Baghdad is already sharing other US-supplied weapons with Iranian-influenced Shia militias, so why not tanks? Let’s put it this way: from any point of view except General Dynamics’s, the Islamic State’s, or maybe the Iranians’, these tank sales don’t add up. It’s easy enough to toss around terms like “military-industrial complex” and equally easy to slip from there into what some might consider blood-for-oil conspiracy theories or suggestions that Iraq War 2.0 was all about the mega-contractor Halliburton’s bottom line. While oil and Halliburton were certainly part of that past war’s calculus, they can no more account for it than the piles of money General Dynamics is about to make selling tanks can alone account for Iraq War 3.0. Still, it’s hard to ignore the way defense companies find themselves buried in cash from selling weapons that aren’t needed to people who can’t use them, sales that are, in the end, likely to harm, not help, America’s geopolitical interests. Perhaps it is better to see the immediate profits from such deals as just a part of a much bigger process, one that demands America have enemies to crusade against to ensure the survival of the national security state. To such a “wartime” paradigm one just needs to plug in new bad guys from time to time, which is proving an ever-easier venture, since each of our previous wars and conflicts seems to offer a remarkably helpful hand increating them. In this way, radical Islam has proven, with Washington’s help, a worthy successor to the Soviet Union, itself once a superb money-making venture and a great way to build a monumental national security state. Even as the Obama administration stumbles and bumbles along in search of a magical political strategy in Iraq that would make sense of everything, American weapons-makers can expect a bountiful future. In the meantime, Washington is putting forces in place that, by doing more of the same for the third time in a disintegrating Iraq in the middle of a fracturing region, guarantee more of the same. In that sense, you might say that American forces are partly in place to help promote the investment. If one needed an example of how the military-industrial complex works today, that might be it. Every mistake by Washington is a boon for future arms sales. So if you’ve got money to invest in General Dynamics, you might want to call your broker.